Powder, brushes, lip tints, brow gels, bronzers and everything nice are the weaknesses to a girl's soul. 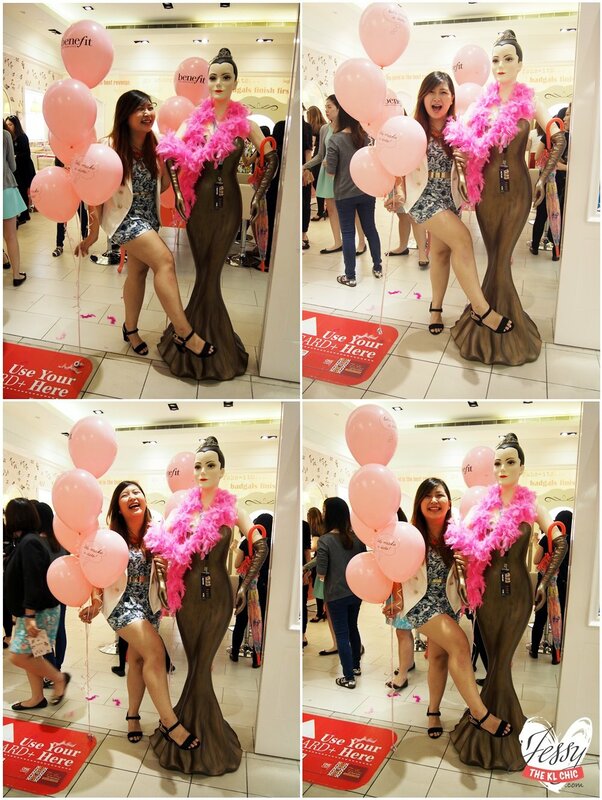 The night was filled with laughter and chit chat sessions as we went deep into the topic of make up at Benefit boutique in 1 Utama Mall (Malaysia). It was a very cozy and intimate session as we got to learn more about the do's and don'ts of make up. We even shared about some of our embarrassing moments we had with some of our make up tools. It was none other than JQxBenefitMY event. So happy for JQ that Benefit threw her a private beauty party session and was so touched when she jio-ed me along. FYI she was voted as Top 10 Malaysian Bloggers in 2014! I could only wish I have the determination as she has because she's been blogging since 2007 (that's 8 long years). It was a pretty chilled session. Noticed that most of the girls were really young and unfamiliar with make up. I remember when I was 18 and I didn't know how to use an eyeliner. Plus I was also so scare to use it, especially liquid eyeliner as there was once I injured my eyes at the process. Seriously didn't had a single clue to any beauty/makeup products. It was really bad I tell you. Last time, I also didn't know that you had to blend the foundation nicely after application. You can just imagine the looks I had from people when I wore make up. I even turned myself looking like a clown once with my crazy make up look. Here is one example, don't judge. Back then I actually thought I looked good, now I can't help but to cringe whenever I see the picture. Any of you got any embarrassing make up stories? Ever seen in high school, Benefit was known as the one of the must have luxury brand. Back then I didn't know there was Chanel or YSL make up line and all I cared about was owning at least one Benefit product, so that I would look cool to the cool kids. haha. Well, in the end, I owned my first Benefit product when I was 20. Funny eh. I guess you have to wait for good things in life to come by. What about you all? Got any memories of the wanting cool brand products while growing up? At the Benefit event, we were thought with EVERYTHING. From the right way to comb your eyelashes to how to get the perfect brows. If only, someone taught me all these after high school. Maybe it could have saved me from joining the circus back then. We even had sweet and adorable refreshments. From chocolate sprinkled covered strawberries to sparkling berry wine. Honestly, it was just a great time catching up with Jane and JQ. Somehow everyone seems so busy with work and studies these days until it's hard to meet. Unplanned outfit match with Jane. Even our bags was black! Oh I finally did something crazy, got so many stares from shoppers in the mall for it. Had fun anyways, plus you're only young once. Btw do stay tune for a BENEFIT Giveaway post this month, wanna celebrate my 800k views. Anyways hope you all have a beautiful week ahead!